Savory foods for breakfast are trendy right now. It makes good sense to start the day with nutritious, filling food instead of sugary carbs. But, if you are a member of the breakfast cereal generation as we are, savory before noon can be a shock to the system. This dish is so tasty that you'll soon forget it isn't lunchtime yet, and it's also loaded with folate, fiber, minerals and protein. In fact, it's a perfect little dish for any time of the day. Most of the cooking can be done the night before, and adding mint and poblano and cayenne chiles from the garden make the dish pop with flavor. The night before, saute onions and garlic in olive over medium high until soft. Add spices and cook one minute. Add chickpeas and vegetable broth and bring to a boil. Reduce to simmer and cook, covered, 15 minutes. Add lemon juice and return to boil uncovered. Cook until broth is thick, about 3 minutes. Season with salt and pepper. Cool and refrigerate. In the morning, heat a small amount of olive oil over low heat and add pine nuts. Toast until golden grown, stirring constantly. Remove from pan. Gently reheat chickpea mixture. Place yogurt in bowls, top with chickpeas. Sprinkle pine nuts and mint on top. Serve while still warm. Oh chick peas for breakfast... brilliant! I love spicy chick peas but this is perfect for the morning. I'm trying it this weekend! I'll let ya know how it goes! A great breakfast idea! I don't eat cereal so I'm always on a lookout for great breakfasts, these chickpeas would be something I would absolutely love! mmm, yum. i'll eat anything for breakfast as long as it's tasty, and this definitely qualifies. Being an egg or oatmeal kind of person, I LOVE this savory breakfast, yum. I love love chickpeas and this is a perfect breakfast or even a midday snack! Love the pine nuts you used too. I love chickpeas too...never thought about having them for breakfast! will have to try this. Chickpeas are one of my favorite beans ever - I haven't ever had them for breakfast - what a great idea! We have a similar North Indian dish called Chana masala. Of course it includes a lot of Indian spices, you couldnt have that for breakfast. Your recipe is just right for the morning. I eat savory for breakfast more often than sweet or cereal. This looks delicious. 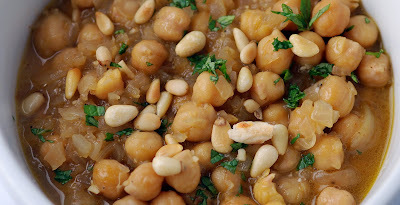 I love chickpeas--they are an all-time favorite of mine. Mmmm...chickpeas! I usually have brie, apples, crusty French bread, and coffee; but I could see having chickpeas for breakfast. Such a delightful & nutritious breakfast!